Paddy Lawless comes from Dublin, Ireland, a city bursting with music. 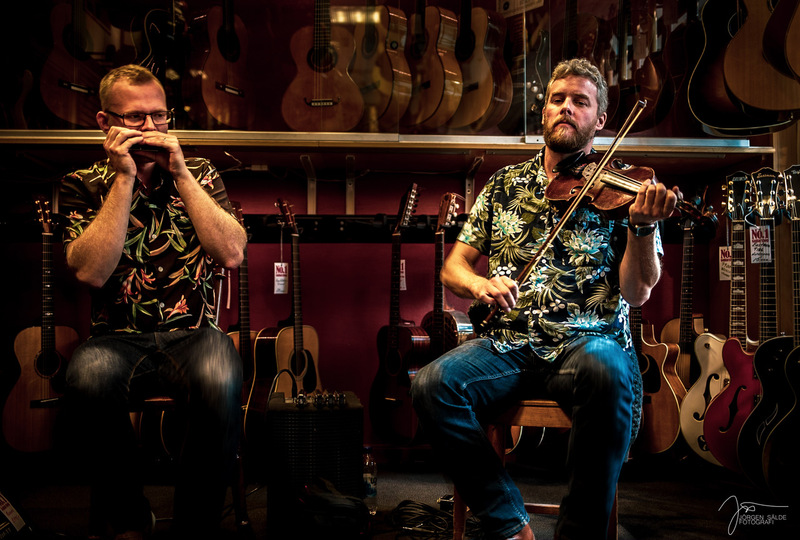 He learnt his music in the vibrant and eclectic session scene in the citys pubs, hearing and absorbing music from all corners of Ireland, distilling those sounds down to a potent musical stew. Living in Sweden since 2002 Paddy is very active in the music scene in Sweden and Denmark. Joel Andersson got his first harmonica at the age of 2 and began playing professional when he was 13 years old. Joel is regarded as one of the finest Irish music harmonicists in the world. In 2014 he came in third place at the biggest Irish music competition in the world, Fleadh Cheoil na hEiréann. In 2017 he came in second place at the World Harmonica Festival, Trossingen, Germany. Joel Andersson is a Hohner Affiliated Customizer and has the attention of the world’s premier harmonica players, inventors, and innovators. By their testimony, his custom harmonicas and original Sjoeberg Combs are top quality and increase the player’s authority over the instrument, regardless of playing style or experience. His precision in custom reed and slot work is also evident in his fine Sjoeberg Combs and Artisanal Cases, which are hand and machine manufactured in his workshop in Höör, Sweden.